"One of a kind...one at a time." The materials we use have been reclaimed and repurposed. We try hard to be environmentally friendly. We take trees that have naturally fallen and have unique characteristics that we think will enhance the beauty of our product. We also try to find mirrors and other material that appear to have lived a good life and are on their way out and we think how it can be turned into something beautiful. Have you been Reclaimed & Repurposed? We were all created in the image of God with our own unique characteristics. Do you feel like you have lived a good life but are spent or do you just feel like you don’t have a purpose anymore? Jesus wants to Reclaim you and Repurpose your life! He died for you because HE saw your natural beauty and HE knows best how your unique characteristic can be used for HIS glory! Do you want to be reclaimed and repurposed by asking Jesus to be your Lord and Savior? If so, contact us below! 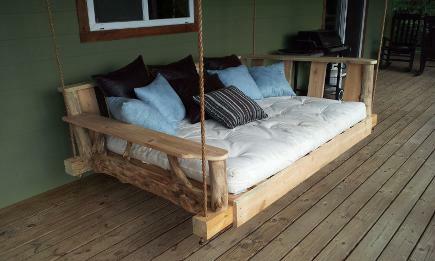 to see details on the swing bed! All designs are created around the natural bends, twists and knots that each piece of wood provides so there are no two items exactly alike. While designs can be reproduced none will be exact replicas of the other. Depending on the uniqueness of the wood some designs cannot be re-created. You can be guaranteed that you are getting a one of a kind original. We hope you enjoy looking around our website! Check out our Rustic Catalog by clicking the tab above and see some creations we have designed...BUT if there is something that you desire us to create for you, please don't hesitate to contact us! We welcome new and innovative ideas! We would love to make you something that meets your decor need!